The Koch Brothers’ nationwide campaign against transit has a new target: Phoenix. A $31.5-billion transit levy approved by a 10-point margin just three years ago is now under threat thanks to an anti-light rail group that portrays itself as grassroots. But records show it is being backed by — wait for it! — Koch-funded organizations and a wealthy developer. The new group Building a Better Phoenix has launched a campaign to gather 20,000 signatures for a voter referendum to overturn the city’s light rail plans. 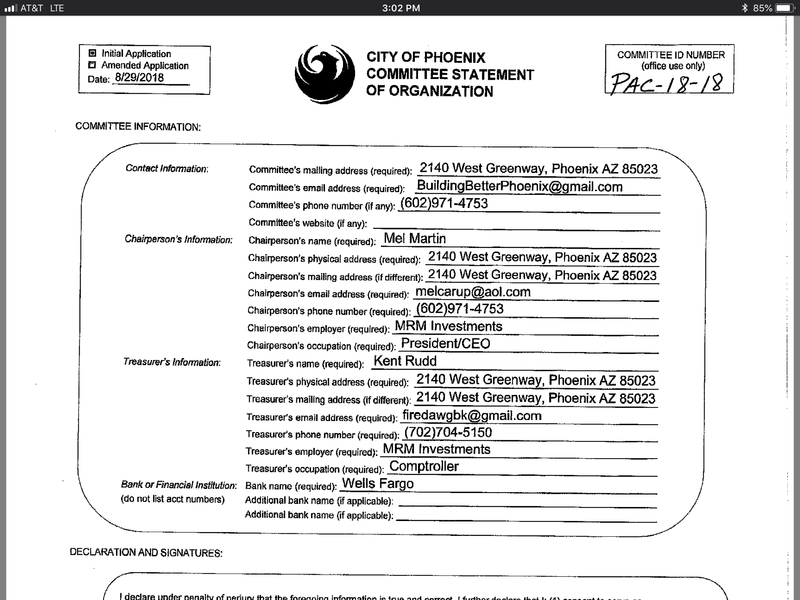 The organization listed Mel Martin — a Phoenix business- and land-owner — as the chairperson [PDF]. Just a few weeks later, however, the organization changed the chairperson to Jadon Contreras, whose occupation is listed as student [PDF]. The address he provided is 4108 Central Ave., which is the business address of Tony’s Window Tinting. Contreras appears to be a relative of Celia Contreras, the owner of the business, who has been leading the charge to halt light rail expansion. He could not be reached. The group hasn’t filed any financial disclosures yet — but it is receiving financial support from the Arizona Free Enterprise Institute, which is a “Koch-connected dark-money group,” the Arizona Republic reported. 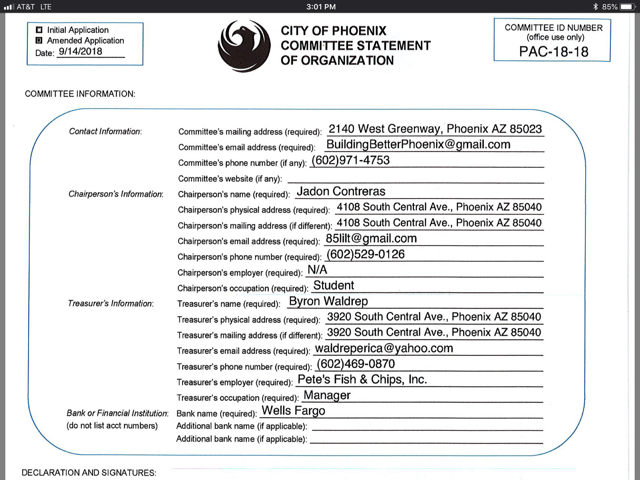 The organization paid for the domain name for Building a Better Phoenix’s website, which is clear from the domain registration [PDF]. It’s clear why Martin would want locals fronting his organization. When the light rail funding measure passed soundly, it had even wider support in South Central, the center of the controversy, where voters gave it a 70-percent landslide. Waldrep said he didn’t know anything about the Charles and David Koch or the Arizona Free Enterprise Institute. But he could not explain why or how the group had paid for the organization’s website. It’s not the first time the Koch Brothers’ shadowy political network has played an outsized role in a local anti-transit effort. The New York Times highlighted the siblings’ successful campaigns to defeat light rail plans in Nashville and other cities. The billionaire industrialists made their fortune in oil and gas and have, since then, supported far-right political causes and have opposing local transit projects. In Arizona, their statewide action group is called Americans for Prosperity. On Wednesday, Phoenix City Council will vote on whether to proceed with the South Central light rail project as planned. Changing the design to accommodate Four Lanes or No Train’s concerns would be a death sentence for the $1-billion project, which is facing a November deadline to finish the design phase and move into engineering. The Trump administration — which is already holding up many transit projects around the country, as Streetsblog reported — may be looking for an excuse to withhold its $600-million share of the project, recently instructing Valley Metro to not submit paperwork until the City Council had voted again on the matter. The Council may give Martin the delay he wants. Pro-transit forces suffered a blow when Mayor Greg Stanton, a key light rail backer, resigned in May to run for Congress. The first line — and two extensions — of Phoenix’s light rail investment have been a success any way you look at them. Daily ridership is relatively strong and the investment in the initial line has spurred hundreds of new housing units in walkable, transit-oriented locations. South Central light rail was to expand it into an underserved area and help connect residents with more economic opportunities. BINGO!!!! After all this time you finally got around to a fact based argument in support of your position. Admittedly, it was already covered back when I mentioned that the Federal Highway Administration reported back in 2007 that all dedicated revenues only covered about half the total cost of the highway system. You might also remember that I was the one who asked if you thought the gas taxes should be increased to cover the subsidies, so apparently I did know about the gas tax. But at least you tried for once, bless your little heart. And then fell back into the usual boring refrain of venom and insults as if you thought that was the same as intelligent debate. You like my research skills? It’s easy. Try this one. Daniel 5:27. No, the gas tax is only supposed to pay for a share (90% for interstates) of construction and maintenance and it no longer even does that, which is why the highway trust fund has had to have bailouts. Operating costs have always been subsidized from the general funds. But you’re right. Trying to engage you in fact based discussion is like picking up buttered Jello. I’ve abandoned any hope. Good, you’re wrong, have been wrong, and will continue to be wrong. IF you want it you pay for it. Sorry, I’ve already tried several times to engage in a fact based discussion but you weren’t interested. I’ve given up on you. I’ve researched it. The fact is that an RPS *will* bring power prices down, Steyer is actaully telling the truth, and APS is lying through their teeth. But don’t believe me. Do your own research on the prices of solar & wind power vs coal and gas power — the numbers are out there. Yeah, I don’t think that’s right — the initiative should have gone on the ballot anyway. The fact is that the utility managements should be adopting RPSes on their own anyway, but they need a wake-up call to realize that solar and wind are cheaper than coal and gas now (since 2016, specifically). Yeah, I get that solar PV and wind are cheaper over the long run, as opposed to the LCOE of a “fueled” generation plant as compared to the LCOE of a “non-fueled” generation plant. MY point is the interloper Tom Steyer will in fact cause rate increases for electricity for the foreseeable future. When going from “fueled” to non-fueled generation the intermittency of the non-fueled solar PV and Wind generation have to be accommodated within the grid infrastructure. The energy storage is not there now and will take time to bring online using Capital Improvement projects. Think about it, within 12 years, Steyers NextGen group wants Arizona to put in another 35% more alternative generation AND also install energy storage for those plants online now and in the future. This is by some’s estimation to be 75 Gigawatts more generation and at least that much energy storage online to compliment the intermittent generation. The up side is energy storage reacts faster than any fueled generation plant online now. Energy storage can be installed along the grid infrastructure and used to take an intermittent generation resource and store it for later use. Power shifting is something the grid has needed for at least 40 years. APS has already weighed in with “their” estimate of 50% by 2030. It is said to be on average of $1,000 a year, about $83 a month, every month added onto your electric bill. The bottom line is, there is NO breakdown of what capital construction of new generation and energy storage sites will cost. Then there will be “decommissioning” costs of some of the coal fired plants and perhaps natural gas fired plants. Electric bills are increased by two major factors. IF you enter into an energy efficiency program and cut electricity use, the Utility doesn’t sell as many KWh, this is called “lost revenues”. The Utility places a rate case in front of the ACC to increase electric rates. When the utility decommissions an old plant, this is called “stranded costs”. The money for demolition, environmental remediation and disposal of debris and toxic substances will be paid for by another electricity rate increase through the ACC. A perhaps aggressive program would be over 25 years, this RPS will be part of Arizona’s Constitution, the will of the people. Pass Proposition 127 and let the rate increases begin!!! How do you make an intermittent generation source like solar PV or wind generation ACT like a “fueled” generation resource like coal fired or natural gas fired generation? Right now “fueled” generation can be ramped up and down to meet demand on the grid. Coal fired plants are operated in what is called “spinning reserve”, coal is burned 24/7, just enough to keep the water in the boiler(s) near steam, just in case the plant needs to be ramped up during grid demand increases. When the utility decommissions an old coal or natural gas fired plant, the ACC will get a rate case to increase electricity rates to recover “Stranded costs”. The Utility will also get a rate increase to build Solar PV and or Wind generation. I’ve done my homework, have you done yours? It’s probably paid for the same way city streets are paid for. Mostly from the general budget. The budget, in turn , is enhanced by the higher revenues generated by development along the corridor. When Tucson built their streetcar, it generated more than a hundred million dollars in new development intended to take advantage of the improved transportation before the line was even open. More than 2,000 new jobs were generated in the community by 2013, a year before the line even opened. The increased economic activity is one of the main reasons why cities that have experimented with light rail normally expand their systems. Rail works. Created or relocated, really, not a very positive statement. Of the so called 2,000 jobs, how many were construction jobs and how many are still employed today? The “fact” that this clown Michael Keith doesn’t know from 1928 through about 1935, the “great depression” was NOTHING like the so called “great recession” of 2007 through about 2012. Although “saying” “…generated more than a hundred million dollars of new development (intended) to take advantage of the improved transportation before the line was even open.” Does not mean it has been done or will be done. These so called “great ideas” have come up short before on grandiose predictions of those like Michael Keith. We the residents of South Phoenix don’t want the South Central LRT. Four Lanes No Train and Building a Better Phoenix is not involved with the Koch Brothers or any dark anything. The money to Legally Collect 40 thousand Registered Phoenix Voters was all paid by residents, business owners and land owners of South Phoenix. The Ugly over hanging wires and poles and loud noisey trains will ruin our Beautiful Views of South Mountain, Downtown Phoenix, the Beautiful Views Sunsets and Beautiful Sunrises. The groofy looking art work and the Vagrants will not make up for the views that will be spoiled. Please help save South Phoenix and South Central Ave. Please Vote to Stop the LRT on August 27th. Thank You. 1 billion dollars for 5 miles and an 18 million dollars a year maintenance fee. The South Central LRT cost more per mile than than the South Mountain Freeway. Why digging a trench and laying track and repainting some lines. Please Vote to Stop the LRT on August 27th. Please help save us Southsiders. We need your votes!!! Thank You. Well Valerie, the up hill battle is not with South Central LRT, it is with entitled tax hawks like Claude. I have stated numerous times that IT IS the right of the citizen, indeed the duty, to determine what the “advantage” to allowing increasing taxes on themselves does for transportation as a whole. Right now, digging the trench and laying tracks will most likely be paid for by floating bonds for twenty to thirty years. The interest on these construction bonds will be paid for by raising taxes in some way to generate the funds to pay off the perspective investors. Most folks will more than likely be strapped with a rise in property taxes, even those who live in apartments. Valerie, do you agree with me that if anyone holding public office even SUGGESTS building light rail in Phoenix or anywhere else in our country, that that person or persons be forced to serve time in Federal Prison for advocating a crime against society? @Solarman – it should be made a Federal Crime against Society to even ADVOCATE for building light rail. You’re so right, Valerie – we in South Phoenix cannot AFFORD to allow THOSE AWFUL VAGRANT PEOPLE to in any way, shape or form have access to and thereby contaminate and forever ruin and despoil our lily-white community. OUT WITH THE UNDESIRABLES! Building Light Rail is a CRIMINAL ACT AGAINST SOCIETY. Personally, I’m NOT disagreeing with you. Of course with the continuing waste of time and money for (some) States of the Union using public funds to sue the Federal Government for any “supposed” transgressions of the division of powers between Federal and State Governments, it has become a political circus, paid for by the tax payers. The hypocrites in California present as the poster “children” of inequity. First making a BIG deal out of saying a prayer in school to the final blow, NOT being able to say the pledge of allegiance to the (American) flag as a supposed “part” of the division of Church and State to declaring “Sanctuary” status for cities and the State, ignoring Federal laws on the books to “protect” society from illegal invasion. Walk across the border, walk to the train station, get a ride to subsidized housing in a “Sanctuary” city. Eric you might think the South Central LRT is a big Joke. The things you say are ridiculous. No I don’t think people who want the LRT should serve time in the Federal Prison. Maybe the people who want to shove the South Central LRT down the throats up the South Phoenix residents they are supposed to represent on the city council should lose their jobs for going against the people who elected them to represent us. I think that any city that want the Light Rail train show have on the ballot separate from any other street improvements. And now that people now see they don’t want it after all should be able to let the people vote again. Please Vote to Stop the LRT on August 27th. I don’t want the South Central LRT. But if the people still wanted and vote for it. I will try to live with it. It will be hard because I live a hundred feet from Central Ave. I will have to deal with the mess, noise and Vagrants it will bring.